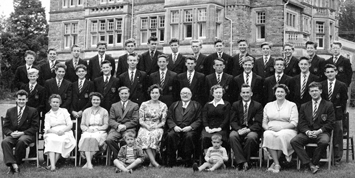 He came to us from Fishguard, which had recently become a bi-lateral school and his association with Fishguard, both school and town, was so longstanding that his departure for the English South must have come as a distinct shock to those who had come to regard him as permanently rooted in the North of the county. His experience of the bi-lateral system fitted him well for taking charge of our unusual combination of grammar and technical education. That he was a firm disciplinarian we had heard in advance; that he would be a friend we sincerely hoped. We were soon to discover that he was both—the Spring 1959 edition of “Penvro” produced the following unsolicited tribute from the pupil editorial board; “We have found not only a leader but a very dear friend.” One is reminded of Goldsmith’s lines: “Yet he was kind, or if severe in aught, The love he bore to learning was in fault.” There are many who have cause to remember Mr. Roberts for his willingness to put himself to great trouble on behalf of those who needed his help. During the ten years of Mr. Roberts’ tenure of office, the school has enjoyed a period of stability, in great part due to the Headmaster’s ability as an administrator, particularly in financial matters. Those who now breathe sighs of relief that the debt on the organ is cleared can thank Mr. Roberts for his unstinting efforts to make this possible. Perhaps he even secretly enjoyed his “sitting at the receipt of custom” on odd occasions when a crisis developed in the dinner-money department! His enthusiasm for and enjoyment of all school functions was very evident and we hope that he will attend them on an “emeritus” basis for many years to come. He is fond of reminding pupils who are leaving that, no matter where they go, they are still members of Pembroke Grammar School. May we suggest to him that this refers to him too, for he must always remain a true friend to this school which he has served so faithfully for the last ten years, ready at all times to give his time and energies to its welfare. We wish him and Mrs. Roberts a very long and happy retirement, full of the pleasure that they so well deserve. OLD PUPILS’ ASSOCIATION: President: T. C. Roberts, Esq., B.Sc. Vice-presidents: Miss A. M. K. Sinneit, E. G. Davies, Esq., B.A. Secretary: D. F. Hordley. Magazine Editor: A. W. W. Devereux This is the last issue of ‘Penvro” to appear while Mr. T. C. Roberts is President of the Association and Headmaster of the School. We should not like the occasion to pass without expressing to Mr. Roberts our sincere thanks for the whole-hearted way in which he has supported every branch of the Association’s activities since he became Headmaster. In particular, it is almost entirely thanks to Mr. Roberts’s energy and enthusiasm that we have in the School Hall the magnificent Miller organ as a memorial to Old Pupils who died in the two World Wars. The idea for such a memorial may have come from the Old Pupils, but it was Mr. Roberts who turned the idea into a reality. As he retires he can feel satisfaction in the knowledge that the organ is free from debt and that it will be a source of pleasure and instruction for future generations of pupils. We wish him a long and happy retirement.